Stunning 3 Sided Brick Ranch Home in Award Winning Community in Suwanee, with Active Swim/Tennis Lifestyle and Direct Access to Suwanee Greenway. Open Floor Plan w/ Rich Hardwood Floors on main, Spacious Gourmet Kitchen w/ Large Island, Maple Cabinets, Granite Counter Tops, SS Appliances, Formal Dining Room, Family Room w/ Vaulted Ceiling, Built-In Bookcase, Computer Room, Huge Bonus room w/ Full Bath on second floor, New Interior Paint, Private and Level Backyard! Don't miss this well-maintained lovely house! Driving Directions: I-85 N Exit 109. Turn left on Old Peachtree Rd, Turn Right on Satellite Blvd. Left on McGinnis Ferry Rd. McGinnis Reserve Community on Right. Turn Right onto Lake McGinnis Dr. Turn Right onto Willow Glen Trail. House located on Left. 3483 Willow Glen Trail, Suwanee, GA 30024 (MLS# 6512666) is a Single Family property that was sold at $446,000 on April 22, 2019. 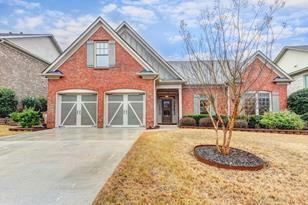 Want to learn more about 3483 Willow Glen Trail? Do you have questions about finding other Single Family real estate for sale in Suwanee? You can browse all Suwanee real estate or contact a Coldwell Banker agent to request more information.